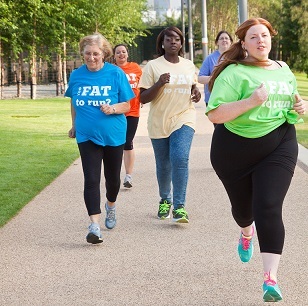 Think you are Too Fat to Run? Too scared to join a running club? Still don’t see yourself as a proper runner? 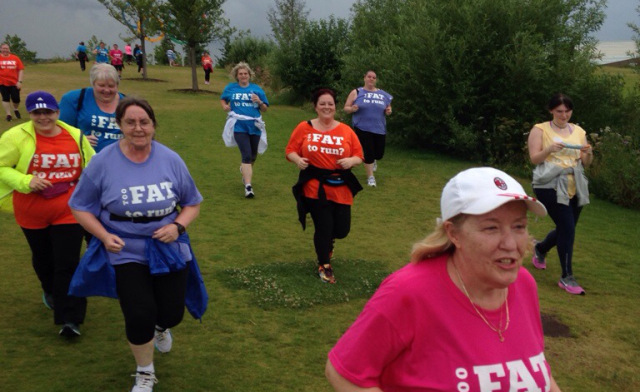 Why not come and join us for a fun and informal day of running with a small group of other ladies from the Fattymustrun community and start thinking about yourself as a PROPER runner once and for all. Absolute beginners will feel right at home here as the running sessions will be adapted to embrace the slowest of runners while at the same time helping to build confidence. However, even if you are a plus size runner with lots of running experience (and some speed) you will also get a lot from the day. The mix of the group is one of the strengths of the day, with everyone learning from one another. Unfortunately due to the costs of putting on these days we are unable to give refunds if you are unable to attend for any reason (including injury or illness) but will happily transfer your place to another workshop or send you merchandise to the value of the workshop price. Cancellations must be given with 7 days notice. Four times a year Julie runs these retreats in her home town of Stratford East London with the run route going into the Queen Elizabeth Park where the London 2012 Olympics & Paralympics took place. Depending on what events are taking place in the park that day you can expect to see all of the main 2012 venues including the Stadium, the Velodrome, the Copper Box, The Aquatics Centre and The Orbit as well as the beautiful parklands and surrounding waterways. Each workshop can only accommodate 25 runners so make sure you book your place ASAP, there has been a lot of interest in these events on the facebook community and once the places are gone they are gone. Why not bring a friend and make a weekend of it? There are lots of reasonably priced hotels nearby and lots of shopping and bars, restaurants etc nearby. 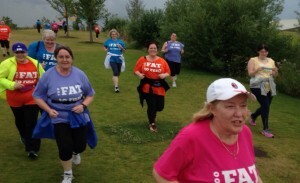 Amazing inspiring day, Julie is an excellent trainer, sensitive to the needs and fears of the plus size runner. Brilliant!! As a 55 year old woman who has never run – EVER – this day was a revelation. I actually did 5K and I feel great, and I know how to keep it going now too!! If you would like a run retreat in your location please get in touch with your local run activator or sports development team to let them know about these retreats, where possible we work in partnership with local agencies. Please help spread the word about these clinics and circulate this flier to friends, family and colleagues. Do you want to be kept updated with future clinics?